Take the following dose at intervals of more than 6 hours and do not exceed 2 doses per day. If possible, avoid taking on an empty stomach. Drink water with each dose. Take the following dose at intervals of more than 4 hours and do not exceed 3 doses per day. If possible, avoid taking on an empty stomach. Drink water with each dose. Take the following dose at intervals of more than 6 hours and do not exceed 2 doses per day. If possible, avoid taking on an empty stomach. Tablet may either be dissolved in mouth or taken with cold or lukewarm water. When I start experiencing pain, what timing should I take EVE? Do I have to eat before I take EVE? EVE is effective when taken as soon as you feel pain. However, it is recommended to take food with EVE if possible in order to avoid taking on an empty stomach. What should I take EVE with? Please drink water with each dose. Does EVE contain an ingredient which causes drowsiness? EVE-A, EVE-A EX, EVE QUICK, and EVE QUICK DX contain a sedative which may cause drowsiness. Do not drive a motor vehicle or operate machinery when using EVE. EVE MELT does not contain a sedative. My pain still persists an hour after taking a dose. Can I take an additional dose? 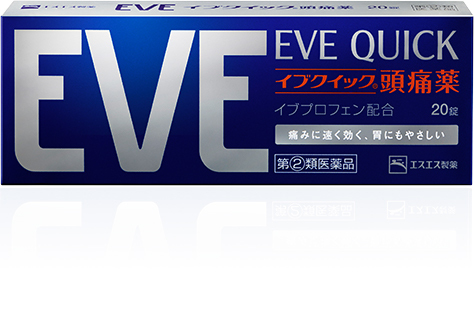 Take EVE-A and EVE QUICK at intervals of more than 4 hours and do not exceed 3 doses per day. Take EVE-A EX, EVE QUICK DX, and EVE MELT at intervals of more than 6 hours and do not exceed 2 doses per day. We recommend seeing medical attention if you are experiencing pain you have never had before, since it could be caused by another illness. I use EVE for headache, but does it work for other pains too? EVE is effective not only for headache but for other pains as well including stiff shoulders, backache, and menstrual cramps. Please see product information for details. Is EVE okay for long-term use? Please avoid long-term use. We recommend seeing medical attention if your symptom does not improve after taking EVE-A or EVE QUICK 5 to 6 times, or after taking EVE-A EX , EVE QUICK DX, or EVE MELT 3 to 4 times. I’m under 15 years of age. Can I take EVE? 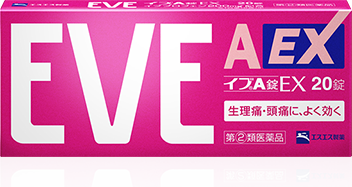 EVE-A, EVE-A EX, EVE QUICK, EVE QUICK DX, and EVE MELT can only be taken by those 15 years of age and older. 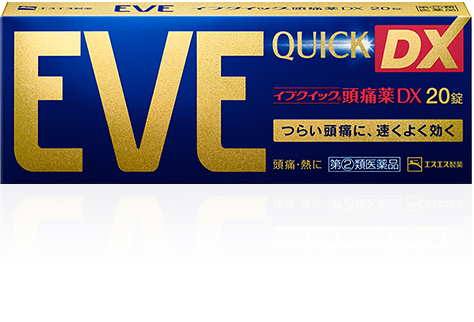 EVE QUICK DX, and EVE MELT? 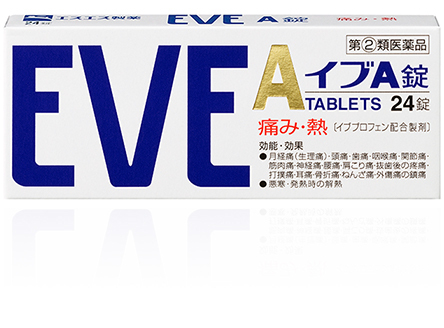 EVE-A works well on menstrual cramps and headache, and its small tablets are easy to take. 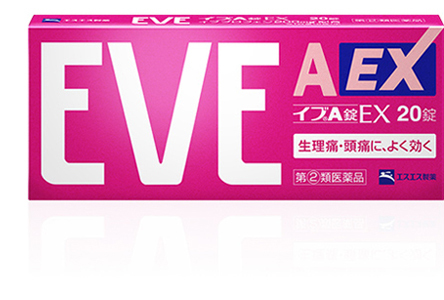 EVE-A EX is an ibuprofen 200mg per dose combination which delivers highly effective relief from severe menstrual cramps and headache.EVE QUICK and EVE QUICK DX are unique ibuprofen and magnesium oxide formulas that speed up absorption of pain reliever ingredient while protecting the stomach lining. They are fast-acting and gentle on the stomach, which are features especially desired for headache relief. In particular, EVE QUICK DX contains ibuprofen 200mg per dose for higher efficacy, delivering quick and effective relief from severe headache. EVE MELT is a new type of tablet called “orally disintegrating tablet,” designed to dissolve quickly in your mouth without water. It provides effective pain relief because it contains ibuprofen 200mg per dose. SSP takes great care from research and development to manufacturing, delivery, and customer support to provide safe and highly reliable products to our customers. 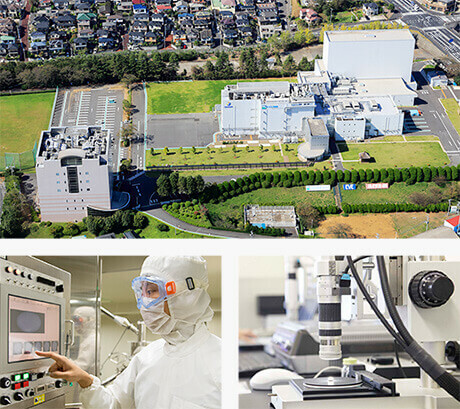 EVE series products are researched and manufactured at SSP Narita Plant in Japan. They are safe and high quality Japanese pharmaceutical drugs manufactured with the latest facilities under GMP* compliance. *GMP (Good Manufacture Practice of Drugs): Manufacturing management and quality management standards for pharmaceutical drugs and quasi-pharmaceutical drugs. SSP CO., LTD was founded in 1765 and has been focused on customer-oriented quality pharmaceutical development and sales for 250 years. 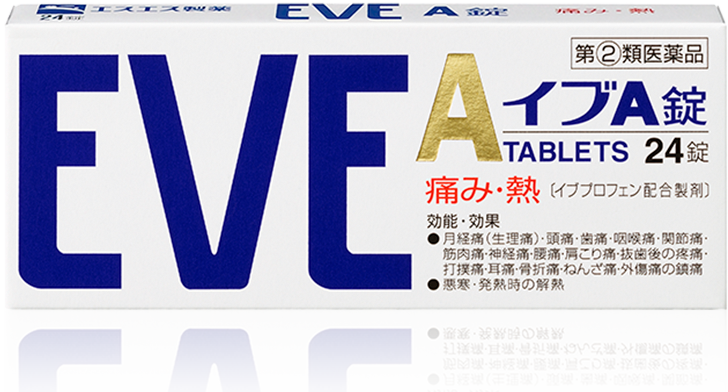 In 1985, pain reliever “EVE” was launched as the first over-the-counter ibuprofen product in Japan. SSP as the origin of its company name “Science and Society” aims to contribute to the penetration of self-medication as a pharmaceutical company specializing in over-the-counter drugs. This suitable symbol was chosen for various reasons, originating from the story of Ōkuninushi-no-mikoto (‘great lord of the land’) of Japanese mythology treating the wound of the white rabbit from Inaba with cotton cattail which was the first medicine-like tale to appear in Japanese history, along with the cleanliness of the color white, and the dynamism of the white rabbit leaping into the air. The contents of this website are based on the Japanese law.